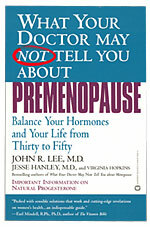 Premenopause / Perimenopause Symptoms: A Book by John Lee, M.D. Here's where to find the Table of Contents for this unique book with real solutions from John R. Lee, M.D. for PMS, fibroids, fibrocystic breasts, weight gain, fatigue, endometriosis, irregular or heavy periods, infertility, miscarriage, and other premenopausal hormone imbalance symptoms, in detail. He also covers the topics of stress, birth control pills, hysterectomy and cancer. Many case histories are included, and Dr. Hanley adds a new dimension to this book by addressing the emotional issues of premenopause symptoms as well as the use of herbs and nutritional supplements to treat symptoms. Copyright 2014 All Rights Reserved, Hormones Etc., Inc.